Is this thing on? As leaders and HR managers, we've all felt the humiliation of being the only one on the company channel sending shoutouts. And beyond the damage to our egos, that's pretty problematic for the company. If HR and managers are the only ones making sure the values of the company are acknowledged and upheld, they simply won't be. 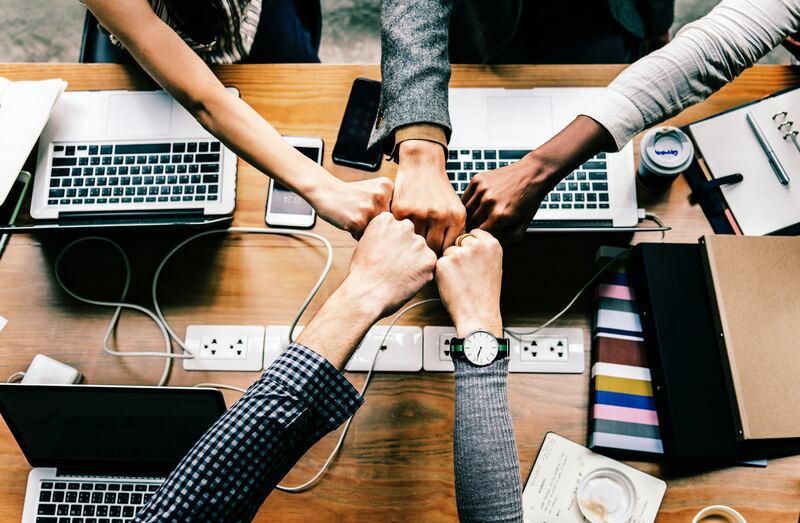 While the vision of your employees singing kumbaya over your company mission statement may feel like just another fluffy HR trend, there are plenty of numbers drawing a clear line between profits and peer-to-peer recognition. Why is peer-to-peer recognition so important? While there's been an increasing emphasis on employer-to-employee recognition in recent years, less has been said about the value of employees saying "thanks" to each other. But peer-to-peer recognition matters in ways that top-down recognition never could. According to an SHRM report, 41% of companies that use peer-to-peer recognition have seen positive increases in customer satisfaction. When your employees are actively uplifting each other, they're actively uplifting your customers, too. Maybe that's why companies who spend a minimum of 1% of payroll on recognition are 79% more likely to have better financial results. Ok, so employees who give each other props have more fun at work and are also great for your bottom line. But how do you implement a peer-to-peer recognition program your employees will use? Here are a few examples to help get your wheels turning. Zappos is famous for being an epically awesome place to work and, as you'd expected, they have a set peer-to-peer recognition program in place. At Zappos, every employee can give a $50 reward to any other employee for a job well done. The only catch is that managers, team leads and supervisors can't be recipients. Fair enough! JetBlue started their peer recognition program, “Lift” in 2012. Employees and team leaders can access the company's recognition platform via mobile, desktop, or tablet to call out each other's awesomeness — both for everyday tasks, as well as big, juicy game-changing acts. The stories are then shared throughout the company. It seems to be a pretty productive approach — Lift has increased recognition satisfaction at Jetblue by 88%! JetBlue data also revealed that for every 10% increase in people who reported being recognized, the airline saw a 3% increase in retention and a 2% increase in engagement. Not too shabby! If you're worried about not having the budget to rival the recognition programs of Zappos and JetBlue — don't fret. In one of our favorite examples of peer-to-peer recognition, software company Typeform has what they call a "Spontaneous Applause clause". Employees are invited to start literally applauding an individual team member for a job well done. And because the whole company has embraced the quirky approach, once one person starts clapping, the whole office joins in. This one takes the concept of slow clapping to a whole new, HR-friendly level. Afraid peer-to-peer recognition just won't happen on its own? Why not take a page from Snacknation's playbook and make it a Friday thing? The snack delivery startup has company-wide meetings every Friday where team members get call out someone they want to "crush", meaning "praise". Employees can crush each other for any task or activity, no matter how large or small. As long as it jives with the company’s core values, it's considered crushworthy. Cloud 9 Living is a gifting platform, so it makes sense that acts of appreciation are fundamental to the way they do things. The company has what they call the 'G' Book, standing for "Good Stuff." Team members are encouraged to recognize each other for any win big or small, business or personal by simply jotting their shoutouts down. If you're a regular here on the PerformYard blog, you know that we boldly reject the idea of a magic HR formula. While it's great to put your head above the water and take a look at the real-world recognition ideas that may work for you, the best answer will always be the one that's the most natural for your unique company and culture. As you set out to create your own peer-to-peer recognition platform (and unleash all the awesome business benefits that come with it), we'll leave you with this great advice from Laura Hughes, HR Manager at adventure company, Geocaching in her contribution to Snacknation. “Find out what forms of recognition resonate most with staff members. Often times, we equate a streamlined process with effectiveness – with recognition, this couldn’t be further from the truth. If we’re taking only one approach to recognition and thereby missing the mark in how we recognize others, it can be equivalent to not recognizing them at all. Encourage managers to ask employees how they most like to be recognized — you might be surprised at the answers that surface!"